The Japanese take sakura season very seriously. This is a country where representatives of the meteorological agency had to take to the television stations to apologise one year when they got their predictions for the flowering season wrong. The cherry blossom is expected to bloom a couple of days early this year in Tokyo, starting from March 24. Before the flowers bloom however, food and beverage companies are already gearing up with sakura-flavoured foods. This has been a long tradition in Japanese cuisine, beginning with sakura-flavoured mochi, wrapped in salted sakura leaves and stuffed with red bean paste. If you are keen on this traditional treat, Ginza Akebono makes a killer version with pillowy soft mochi, silky red bean paste that is not too sweet, wrapped in a crisp salted sakura leaf. Nowadays, however the flavour comes in assorted newfangled food products. We round up some of the popular ones. The coffee chain faithfully trots out a pink flavoured beverage every year. This year, it is offering three drinks. The Sakura Strawberry Pink Mochi Frappuccino (580 yen, S$6.99) has a sticky texture thanks to the use of domyoji-ko, a powder made from dried glutinous rice. The drink also contains sakura flavoured mochi bits and strawberry chocolate chips, and is topped with a whipped sakura mochi sauce. The other two beverages are Sakura Strawberry Pink Milk Latte, includes bits of sakura leaf and sake lees, and Sakura Strawberry Pink Tea, Starbucks' first sakura flavoured tea offering. Just in case this is not enough, the coffee chain is also offering a mass market option: the Sakura Caramel Milk with Mixed Berries. The sweet milky drink is flavoured with cherry blossom and has bits of berries in it. It is also available only at convenience stores for 219 yen (S$2.63) for a 180g cup, according to a report from website SoraNews24. If you fancy a stiffer concoction than milk, beer company Asahi has just the thing. No, not sakura flavoured beer although that may sound like a good craft beer option. The company is repackaging its standard Super Dry beer in cheery pink cans and pink labelled bottles featuring a flowery motif. 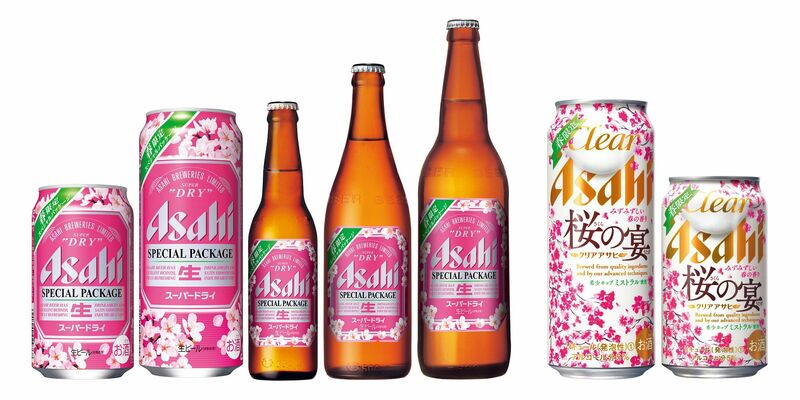 There is also a new beer, Sakura no Utage (Cherry Blossom Banquet), part of the brand's Clear Asahi line, which is labelled with a profusion of pink blooms on a white background. According to Asahi, this beer made with mistral hops will have a fruity aroma. Just the drinks to pack for hanami parties. Of course the chocolate company that has made unusual flavours its signature would get in on the flavour party for the season. Its upmarket Kit Kat Chocolatory boutiques will offer a Strawberry Sakura flavour in a tall cylinder decorated with pale pink flowers. Included in the package is a wooden sakura charm. 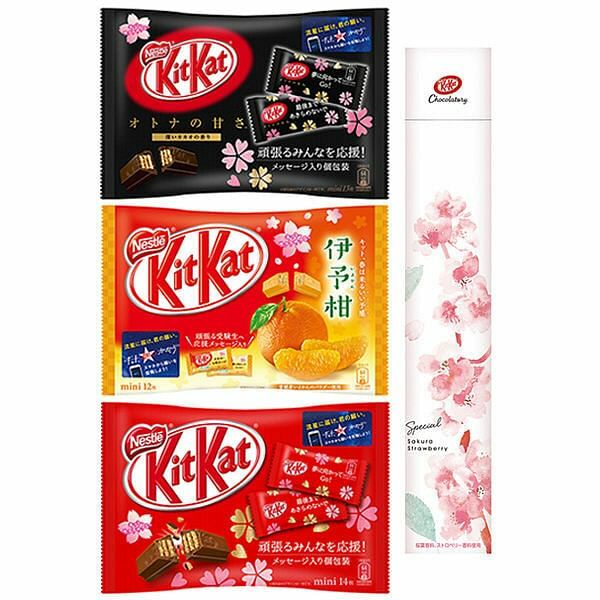 For the mass market, there will be three Kit Kit flavours repackaged in flower-themed wrapping: milk, dark and iyokan, which is a Japanese citrus. When it comes to unusual flavours, Glico gives Kit Kat a run for its money with a mindboggling range for its Pocky snack. Its offering this season is a Sakura Pocky, which comes in a classy black box featuring a trickle of flowers. Priced at 365 yen, each box contains four smaller sealed pouches and 24 sticks. The sticks are dusted with both sugar and salt, mimicking the traditional salted kick in Japanese sakura sweets. Foodies will know that one of the best treats to hunt down in Japan are ice creams at the konbini (convenience stores). 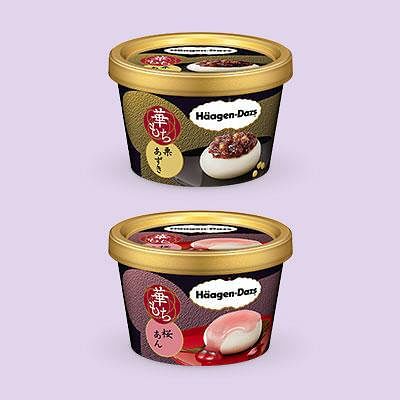 And ice cream brand Haagen-Dazs has refined its konbini formula to an art, offering limited seasonal flavours such as chestnut and black sugar. For spring this year, it has amped up things with a Mochi Sakura An tub. In each tub (324 yen), there is sakura ice cream, mochi which is topped with a sweet salty sakura and red bean paste, and a drizzle of sakura sauce. If all these things have not satisfied your sweet tooth, then American pastry chain Cinnabon’s sakura offering will fit the bill. 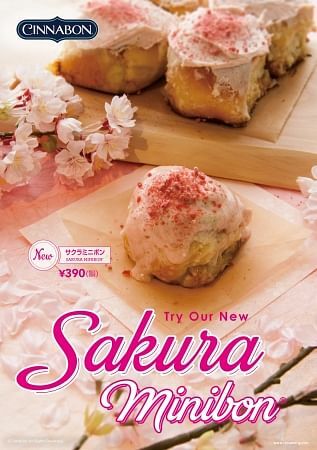 This year, it is introducing a Sakura Minibon, a petite version of its cinnamon bun, topped with a sakura flavoured cream cheese topping. Dusted on the cream cheese is a sakura crunch topping. It is priced at 390 yen each, and 1,170 yen for a pack of three. SoraNews24 reports that this limited edition flavour will be available only at three outlets at Roppongi, Futakotamagawa Rise S.C., and Cocoon City.